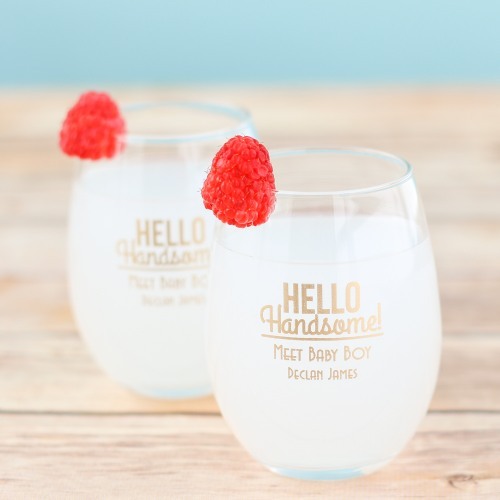 Hosting A Boy Baby Shower? 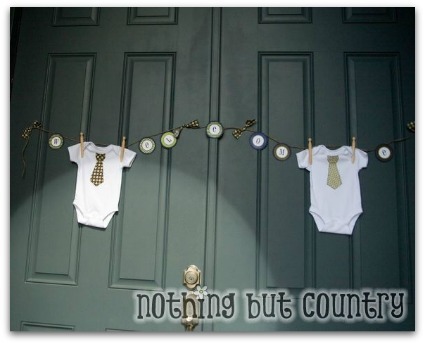 Below are all kinds of fun ideas to welcome a new little guy into the world! This page is overflowing with baby boy cuteness! Little man, bow tie, mustaches and everything BOY! Melt the chocolate in the microwave according to package directions. Add food coloring, stir, and dip the ends of each cookie into the colored chocolate. Add the mini chocolate chips for the eyes. Lay on waxed paper or tin foil to dry. Serve on a platter for guests to enjoy at the baby shower, or bundle them up in cellophane bags and give as baby shower favors! 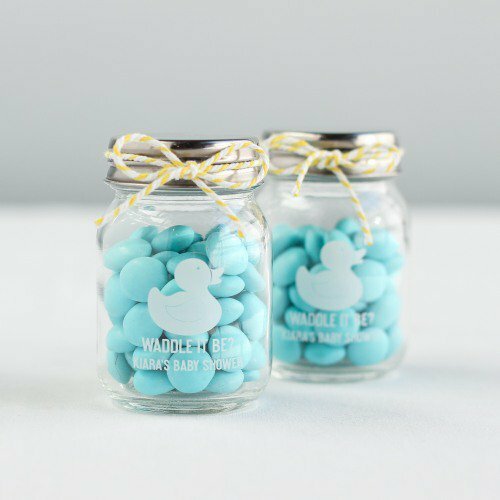 The perfect baby shower treat! The best food coloring in the entire world are Wilton Icing Colors - they produce such vibrant colors and you only have to use a tiny bit, which makes them last forever. 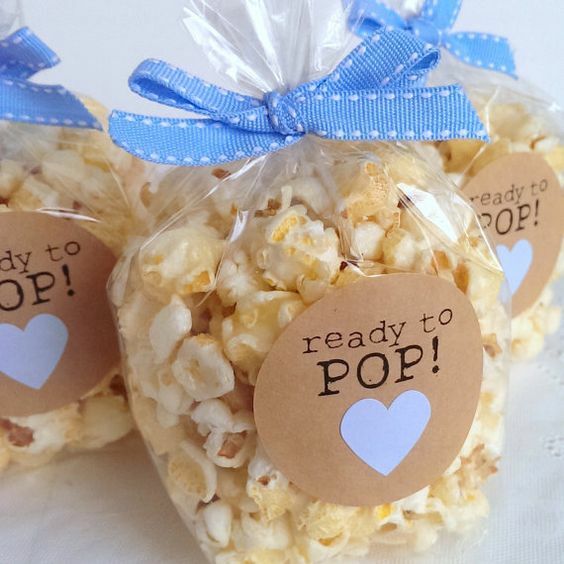 add a cute ribbon and a favor tag that says "Ready To Pop!" Or "She's About To Pop!" Visit our "She's About To Pop" baby shower ideas page - we made some FREE printable tags that would be perfect for this favor idea! 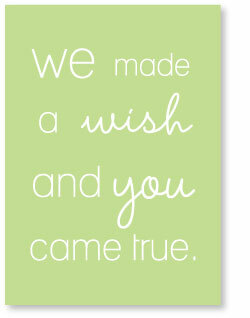 I designed this free printable wall art to cut down on the costs of your planning! Simply print, trim and place in a picture frame! 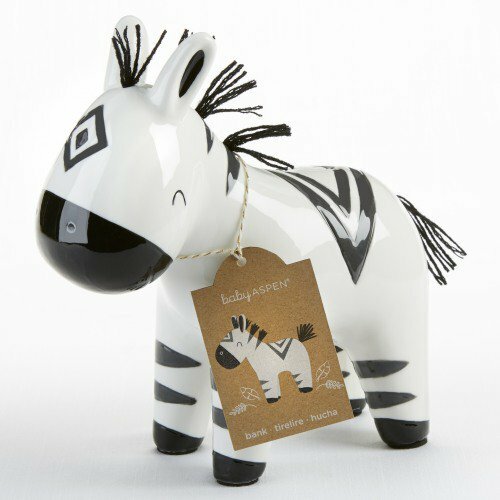 Place on the counter at the baby shower for a cute decoration - then give it to the mom-to-be to decorate her nursery! You can easily make this cute button letter sign by creating a word document with a large letter (first letter of baby's name) - and adding the birth details at the bottom (optional) - if the baby hasn't been born yet, you can just put the baby's firts and last name. Purchase several buttons to match the color of the baby's nursery. Coat the printed letter with a thin layer of craft glue. Place the buttons neatly onto the letter. Let dry and place in a frame. 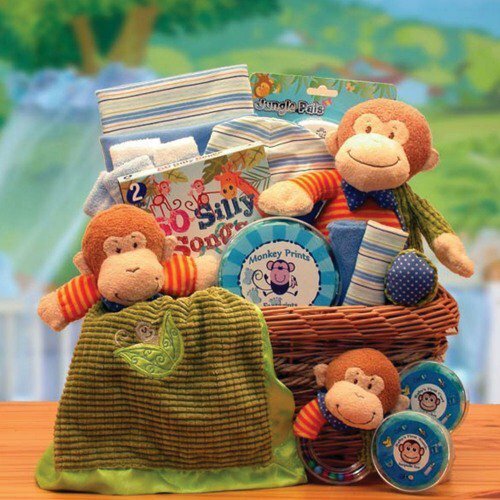 Fill a cute basket with an abundance of "boy stuff!" Onesies, socks, blankets, rattles, clothes and stuffed animals, trucks, a personalized soft blanket, a big blue piggy bank, or a hooded baby bath towel. - you can also use other items instead of a basket, such as a toy dump truck or a toy bin. 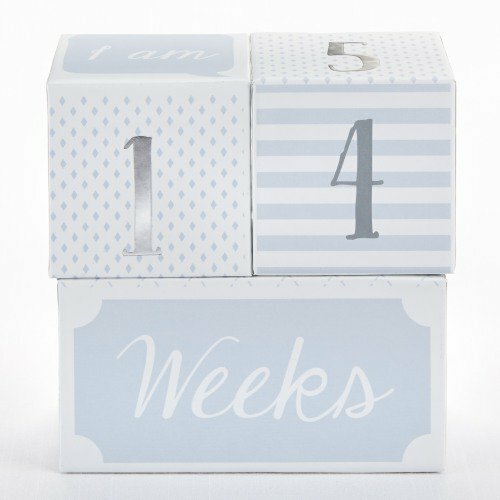 Be sure to hop over to our "Baby Shower Gifts" page! 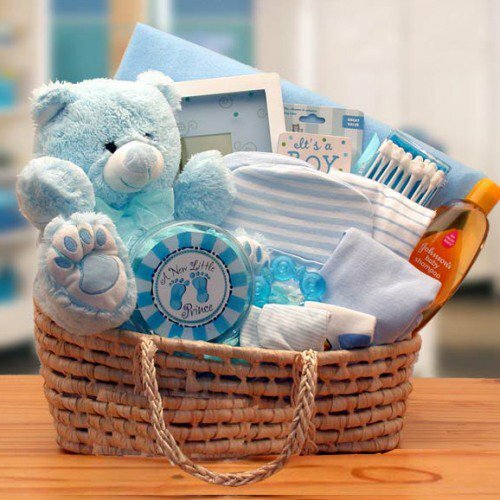 It is overflowing with handmade baby shower gift ideas, cute gift sets, baby basket ideas and more! 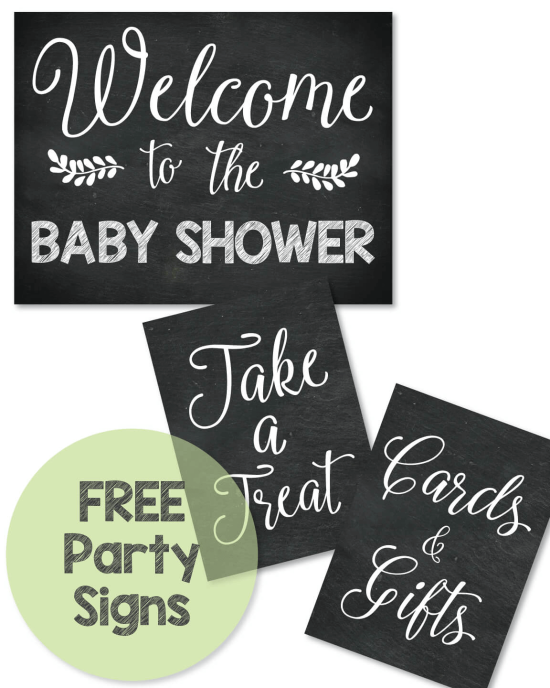 Check out this "FREE printable baby nursery sign!" 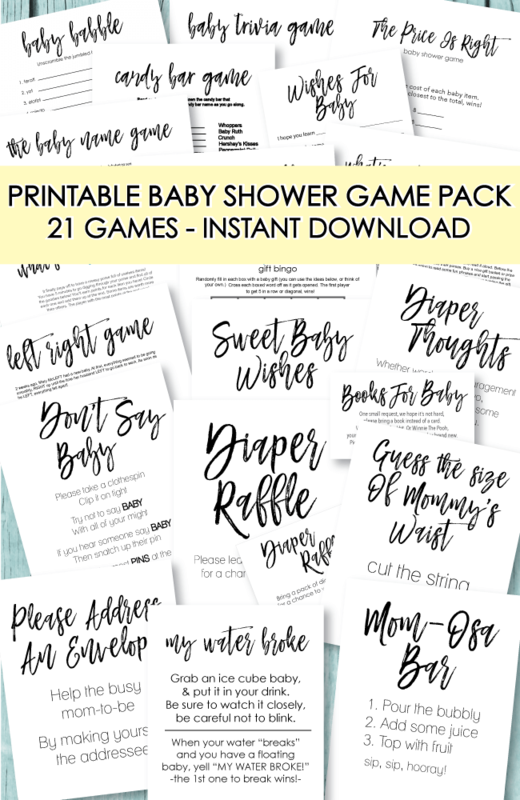 There are "diaper and wipes" baby showers too - sometimes mom's with more than one child already have all of the baby gear needed - and just want the necessities such as diapers. 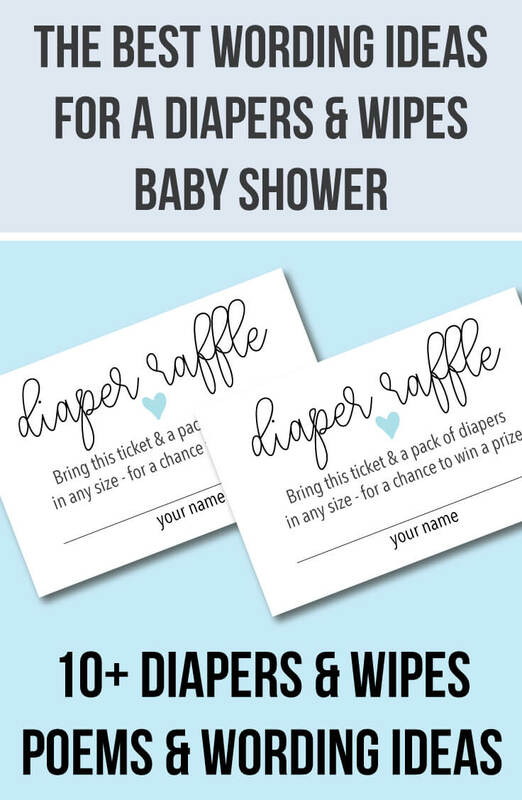 Be sure to play the Diaper Raffle Game if you decide to host a diapers and wipes shower! First ask the mom-to-be if she is doing her nursery in a certain color scheme. There are so many fun and stylish patterns and color combos in stores today! Boring boys themes have been jazzed up and are so cute! If the expecting mommy has a certain theme in mind, jot down her ideas and thoughts. Decorate with color coordinated plates and napkins and supplies. Target is my go-to store for finding the cutest baby shower supplies! 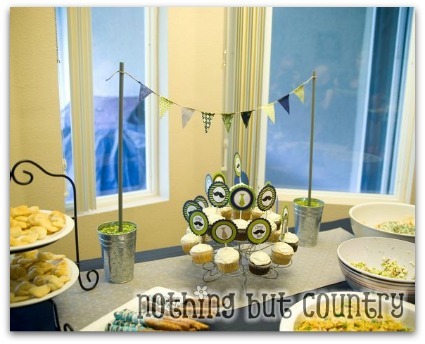 They have the cutest boy baby shower plates, napkins, cups, balloons and banners! If you don't have a Target near you and love to shop online - You can never go wrong with Amazon! Float colorful balloons all around - my new favorite way to use balloons are to sprinkle confetti inside before blowing them up. 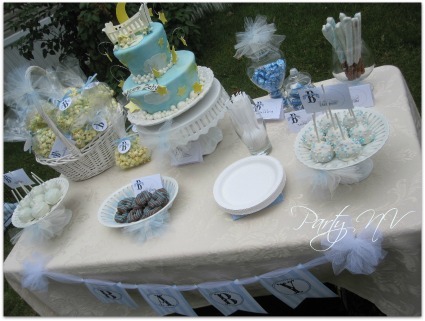 For a boy baby shower, use clear balloons and sprinkle in blue confetti - or whatever color matches your baby shower theme. Make a batch of yummy sugar cookies, cut into cute airplane shapes. Frost with blue frosting, wrap in some cute bags and tie with a blue ribbon. 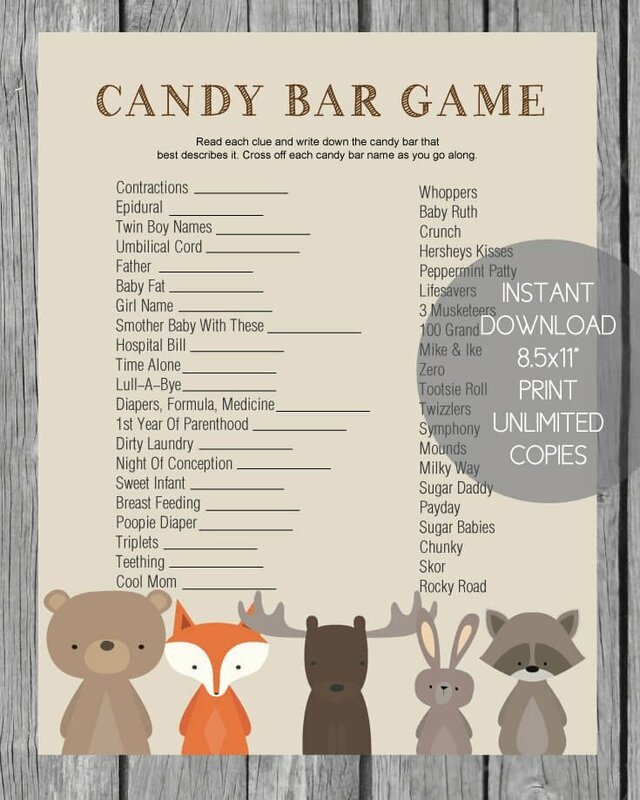 Baby shower games are always fun. One of the oldest games is the toilet paper game. Have each guest to pull off the amount of tissue they think will perfectly fit around the pregnant mom. The one closest to the measurement wins. There's the clothes pin game. Give everyone one clothes pin. Pick a "word" that if the word is said out loud the person that first hears the word can steal the pin. Normally it's words like "baby" or similar. 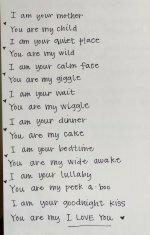 Make it a word that will be centered around having a baby, so it will be hard to not say it. At the end, the person with the most pins win. There's the baby items on a tray game. Put some random baby items on a small tray, like pacifier, diaper, thermometer, baby spoon, etc, and pass the tray around. Put the tray away and have everyone write down the items that were on the tray. The person that got all the items right wins. 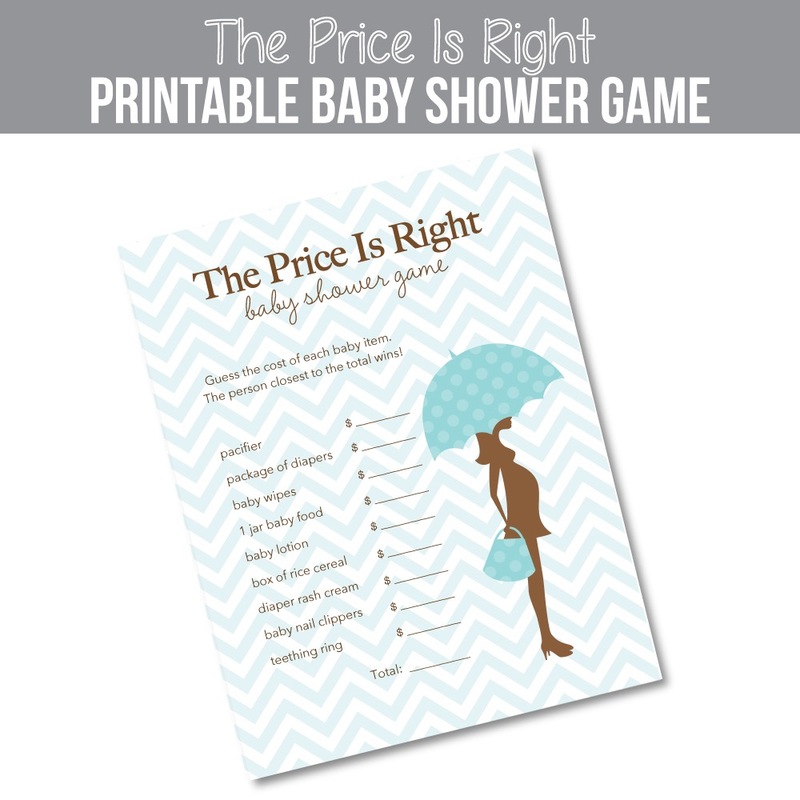 Be sure to have a few good baby shower prizes and gifts for the winners of the games. 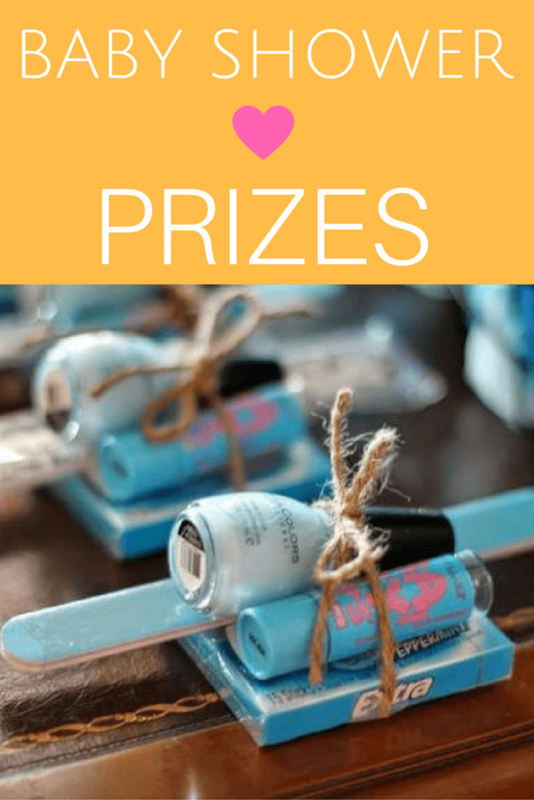 Things like scented lotions, candles, costume jewelry, etc makes good 'shower winner' gifts. 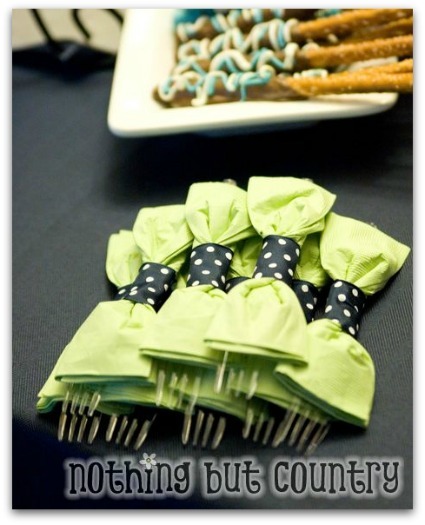 Just place them in a gift bag with tissue paper to make it festive. 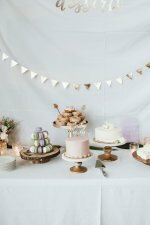 Have finger foods such as little sandwiches, melon balls, cookies, mints, nuts, chips or party mix, displayed on another table along with paper plates, plastic forks and napkins to match the shower theme. 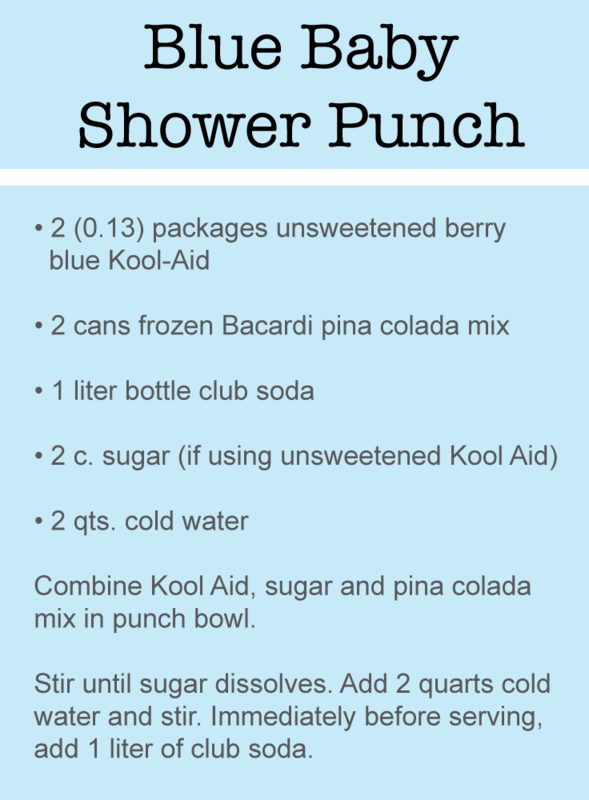 Have a big bowl of fruit punch (in the mom's favorite flavor) for the drink. You can offer bottled water on ice too for those who may prefer water. 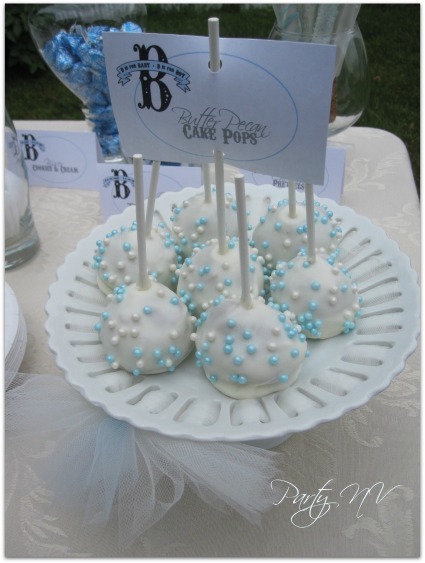 Below is a scrumptious baby shower treat to make - you can alter the colors of the baby shower cake pops to match any cute theme or color scheme. 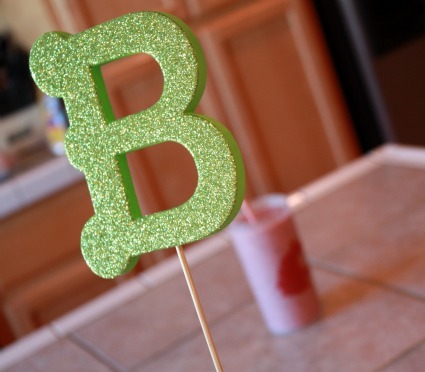 The talented, Jodie, from Party NV recently styled this elegant "B Is For Boy Baby Shower!" The soft baby blue and cream color scheme is so warm and inviting! Look at these cake pops! Amazing! And they are butter-pecan flavored! The pearlized sprinkles coordinate with the table perfectly! I am loving all of the sweet treats offered, and the mini fondant figurines are so cute and perfect! The internet is overflowing with pink girl-themed baby showers! 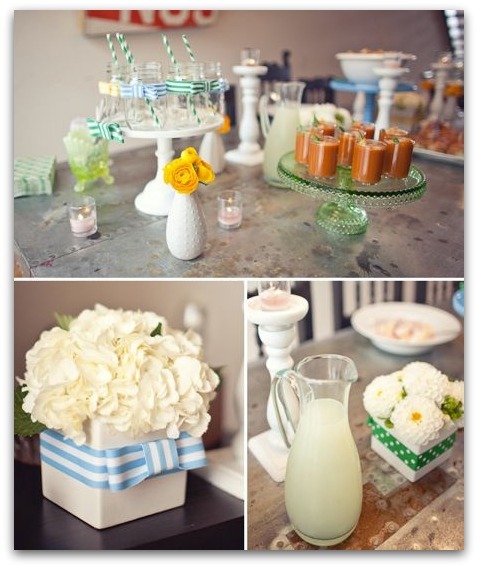 So to come across a baby blue shower is so refreshing - and adorably sweet! This whimsy 2 tiered cake is bursting with cuteness! Love how the moon and stars theme is blended in with other baby items such as a floppy-eared bunny, a baby bottle, blocks, baby booties and a crib! 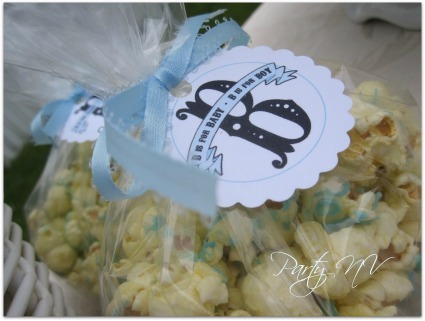 For party favors, Jodie made some popcorn and drizzled blue chocolate over it! Then she bagged it up and tied a favor tag with some blue ribbon. Yummy white chocolate dipped pretzel rods! 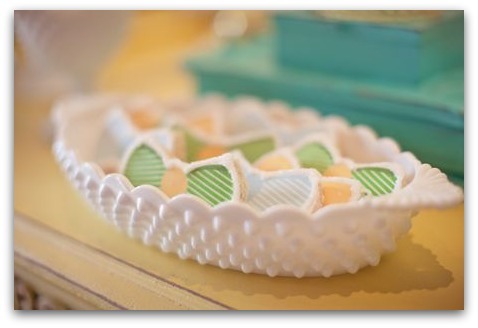 These are simple to make and make such a cute impression! A couple more simple treat ideas are: dip Oreo's in white chocolate and drizzle with chocolate that has been tinted with blue food coloring/ you can also put peanut butter between 2 Ritz crackers and sandwich them together - dip in white chocolate. 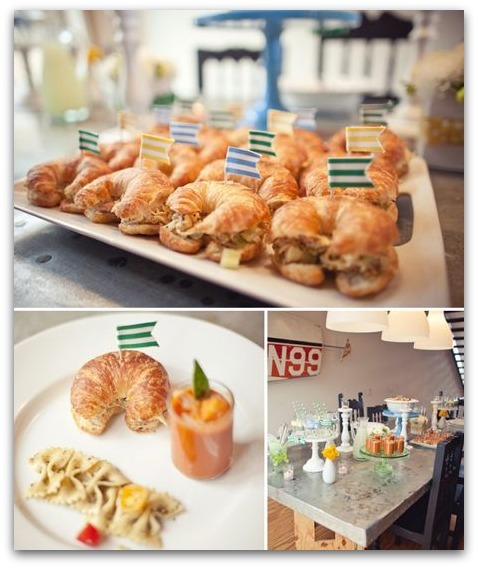 A huge thanks to, Jodie, from Party NV, for sharing her beautiful baby shower with us! 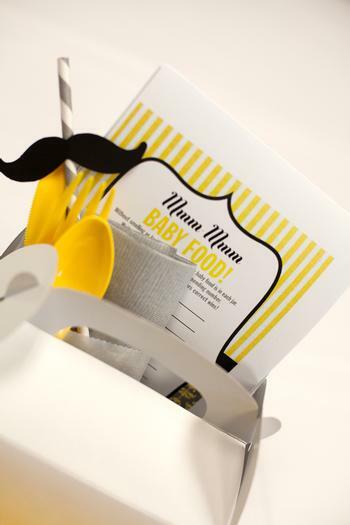 If you are planning a mustache-themed shower, you must take a peek at this adorable "Little Man Mustache Baby Shower!" 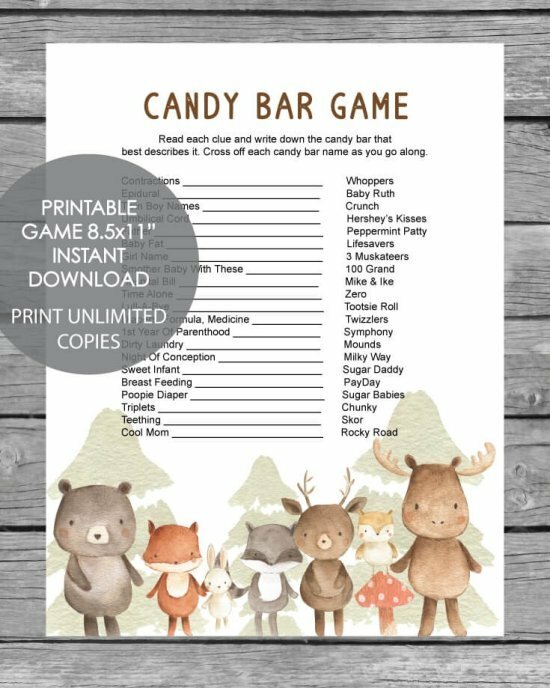 The creativity that went into this celebration is sure to give you gobs of inspiration when planning your boy baby shower! 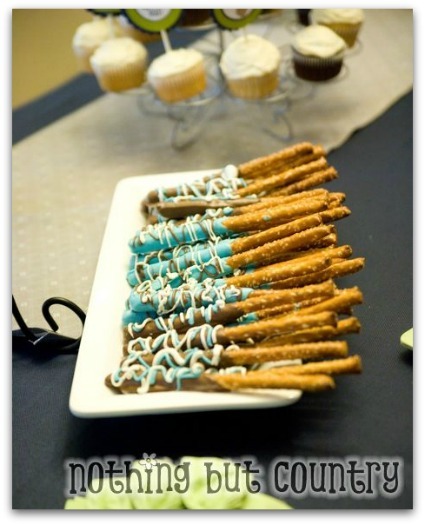 This baby shower was styled by the talented Mary Beth of Nothing But Country! 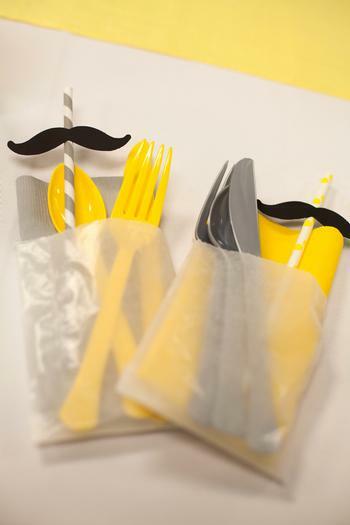 Little man mustaches are so popular right now and they bring a fun and playful vibe to the boy baby shower theme! These cute bow tie napkins are my favorite part of this whole baby shower! I think it is the creativity and simpleness of them! This proves that cute doesn't have to be hard! What a festive way to greet guests as they come through the door! A welcome banner along with little man onesies! You can find little man tie appliques for ironing onto shirts at most craft stores. Hobby Lobby has them! The mini pennant banner is displayed in such a cute way! You could use empty soup cans (even wrap them in scrapbook paper if you want), fill with colored pebbles and poke skewers into them! For the pennant, simply cut small triangles out of scrapbook paper that matches the baby shower for a boy theme! What a wonderful food table! So clever! What a great way to serve drinks! 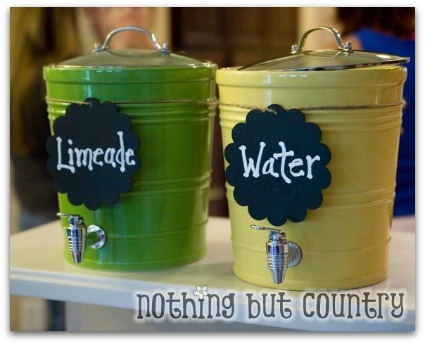 Look at how she used chalkboard labels to write the names of the beverages on! There are so many wonderful, refreshing drinks you can make - Make healthy fruit-infused water by adding slices of fresh strawberries, limes, oranges and/or lemons to regular water! This tastes delicious and has no calories! Cucumber water tastes great too! 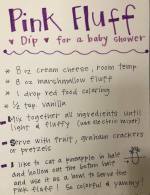 We also have tons of great baby shower punch recipes! Chocolate covered pretzels are an easy way to make a wonderful impression! 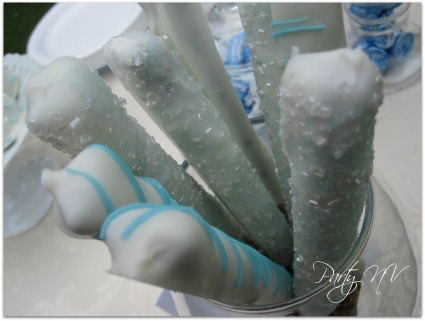 Simply dip pretzel rods (or any kind of pretzel) into melted chocolate (you can tint white chocolate with food coloring to match your color scheme) - sprinkle with colored sugar and let dry on waxed paper! So delicious! 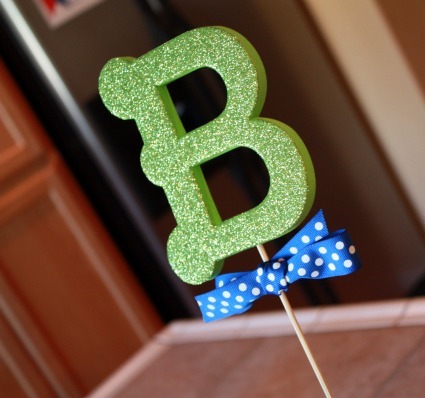 Another baby shower decoration idea that is even easier is to purchase a glittered letter at the craft store and poke a food skewer into the bottom of it! around the stick! So easy! You can also poke it into a baby shower cake, or buy mini letters and poke them into cupcakes! 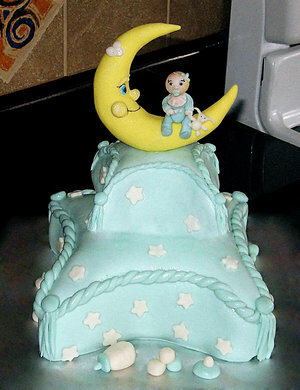 If you are loving the "Moon and Stars" theme for baby shower cakes - we have more! 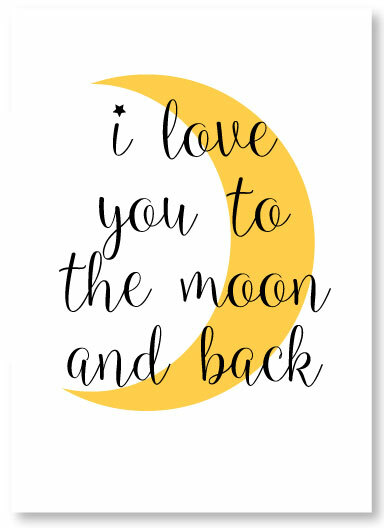 Print off our FREE printable "I Love You To The Moon And Back" print, place it in a picture frame, and give to the mom to be as a baby shower gift! 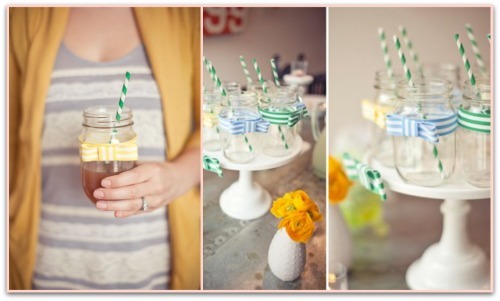 It can also be used for a cute decoration at the baby shower! Click here to visit the popular moon and stars post. We recently discovered this original and absolutely stunning "Bow Tie Baby Shower" or "Little Man Baby Shower" from My Sweet and Saucy! Every little detail is amazing! Make sure you take note of the bow tie garland made from ribbon and diapers! My favorite is the beautiful ruffle cake and the adorable mason jar glasses! So cute and perfect! This ruffle cake is amazing! 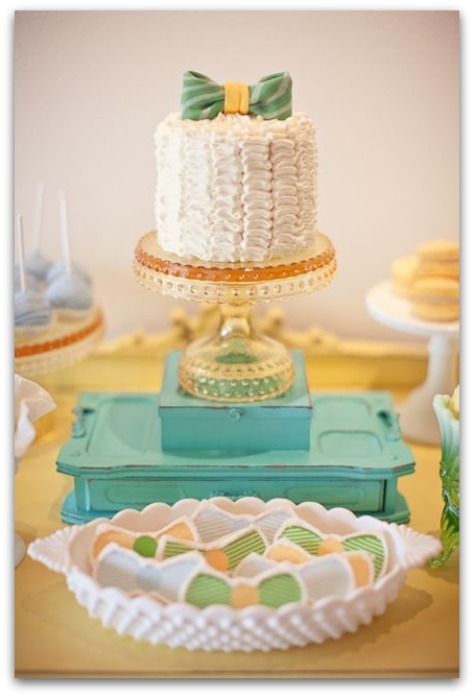 Love the vintage cake stand used and the cute bow tie topper! The coordinating ribbon around the mason jars is a great example of how you can make a cute impression without having to spend a ton of money. Perfect little bow tie cookies! Sweet little baby socks have been wrapped with cute ribbon and hung. 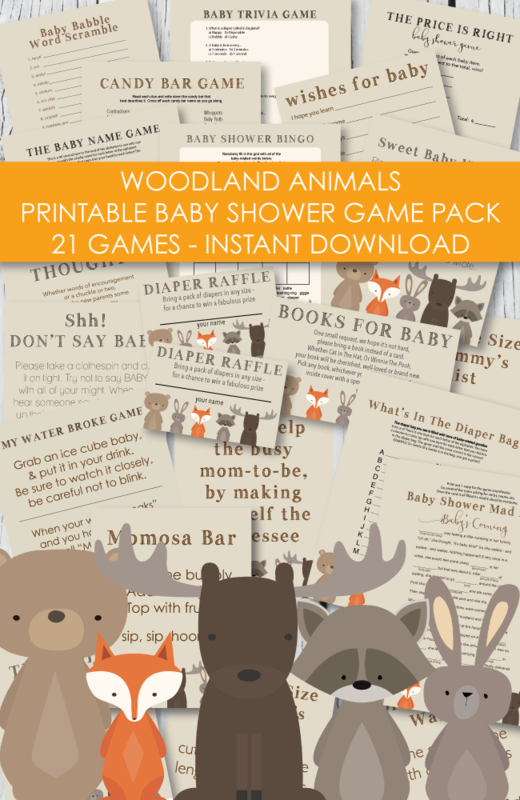 And you can give the baby socks to the new mom after the shower is over - so cute and clever! Don't you just love this chest of drawers! So shabby chic and it was found at an LA flea market! The vintage bowls and dishes compliment the dresser perfectly! Thanks again to My Sweet and Saucy for letting us share this wonderful event! 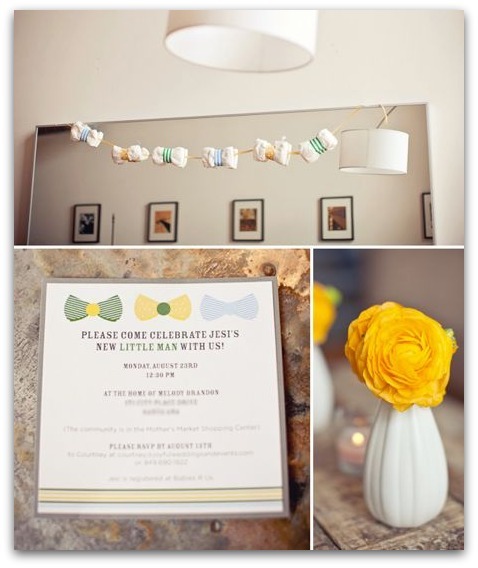 There are so many creative possibilities when decorating for a "Little Man Baby Shower" You could incorporate the popular mustache theme into the bow ties to make a complete "Little Man" baby shower! 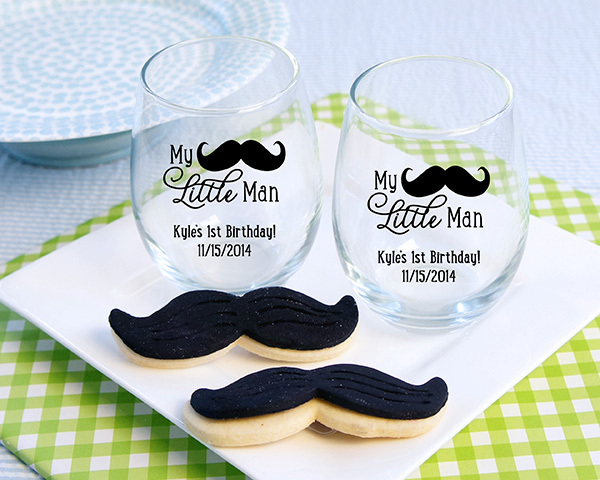 You can find these cute Little Man stemless wine glasses and mustache cookie cutters here. Whip up a batch of yummy sugar cookies that have been cut into mustache shapes like the ones above. Package them up in, cellophane bags and tie with a cute bow! Don't forget to add a favor tag! A great tip for frosting sugar cookies is to simply buy the frosting tub that you use to frost cakes (vanilla works best), and add food coloring. Tastes great and is so easy! Wrap water bottles in cute "Little Man" water bottle labels - you can also use the labels as napkin rings! - Make simple water bottle labels by buying scrapbook paper in the theme you want, cut into strips and adhere with clear packing tape. 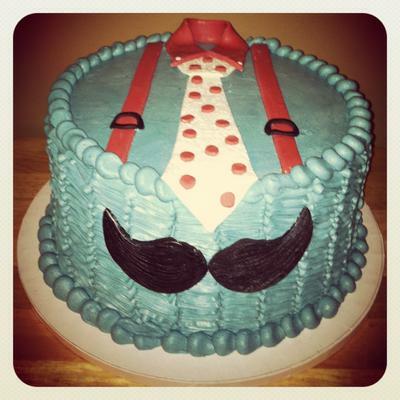 This "Mustache, Little Man Baby Shower" was submitted by Tiffany Berkeley from Augusta, Georgia. The mommy-to-be’s favorite color is yellow so we decided to use a yellow and gray color palette. We used bow tie onesies and mustache design elements and, since it was a little man theme, she suggested that we use argyle and seer sucker patterns as well. Baby shower invitations for a boy were customized with the yellow and gray argyle pattern with a yellow and white seersucker striped onesie. Tables were covered with white linen tablecloths with gray or yellow pashmina scarves used as table runners. Vases with yellow and white flowers served as centerpieces on the guest tables. Baby themed disposable cameras and baby shower mustache photo booth props were placed on each table for guests to pass around and take pictures throughout the shower. 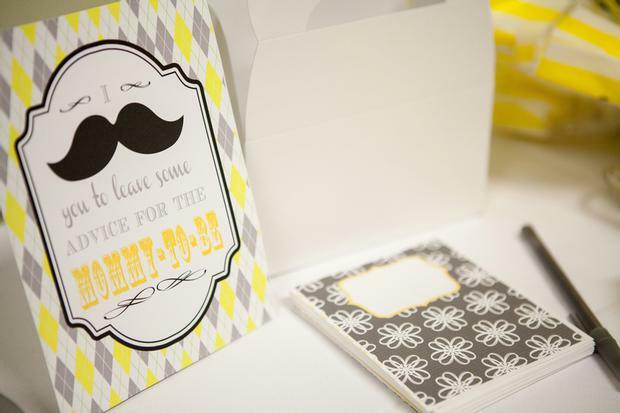 Place settings alternated between yellow and gray plates and on top of each plate, a white gable box labeled “My Stache” was filled with all the necessary supplies for the baby shower. “My Stache” boxes included flatware, napkins, a mustache straw, 3 game cards, a pen, and a packet of M&Ms matching the shower’s colors. 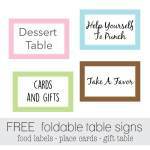 cards, party circles, advice cards, water bottle labels, and food tent cards. Yellow and white striped napkins, which mimicked the seer sucker pattern in the paper products, were used at the baby shower dessert table. A spread of appetizers included a cheese and grape tray, vegetable tray, mini quiche, sweet & sour meatballs, ham sandwiches, and cheese with meat dip served with tortilla chips. Drinks: Lemonade and iced tea as well as mini bottled water with custom bottle labels in the shower’s colors and patterns were served. The M&M packets, which doubled as game pieces for the Baby Bingo game that guests played, were a perfect favor for guests once the games were over. 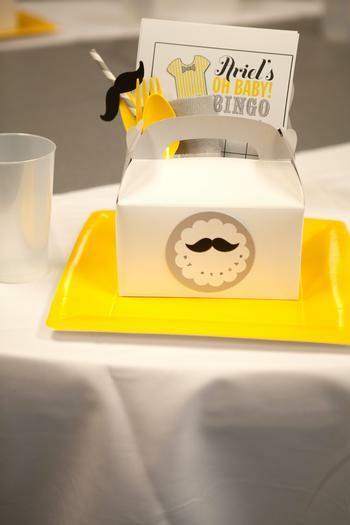 The “My Stache” gable boxes were used by guests as take out boxes for all their goodies. Sugar cookies were bagged in yellow and white striped favor bags for guests to take as they left. This is a wonderful little man baby shower! 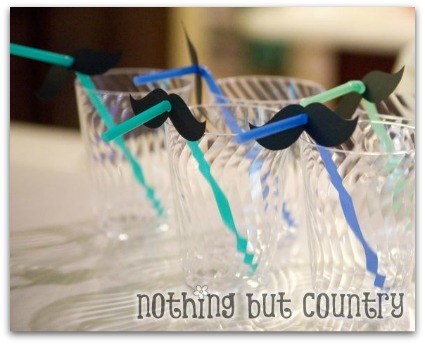 The mustaches on the straws is such a cute idea and will help break the tension that you sometimes have at baby showers! Thank you for sharing! 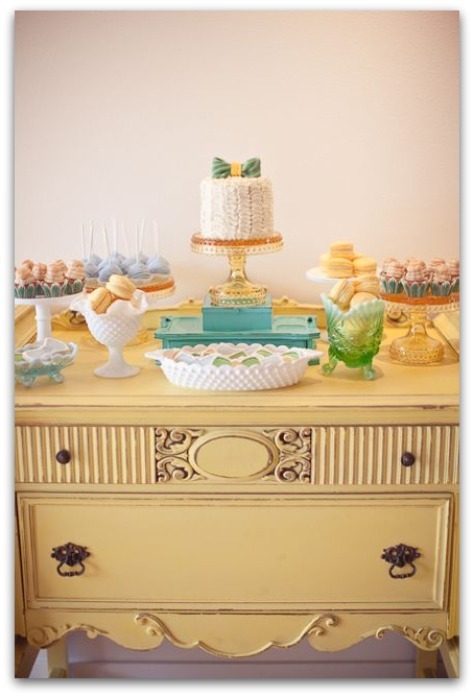 I just love the "Little Man" theme for a baby shower! So cute! I really like the colors you used too. 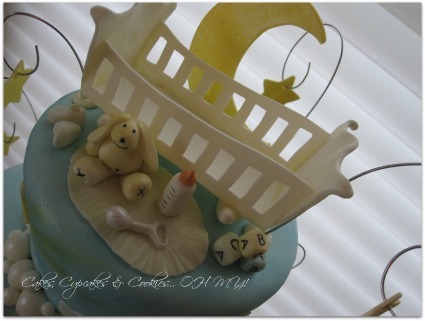 See some pretty cool baby shower diaper cakes for boys.